What kinds of security features does TimeForge offer? Why can’t my employees clock out for a break? Why can’t I see other Departments? How do I prevent overstaffing? Why do my employees see Re-confirm? I think TimeForge rocks! How can I recommend it to a friend? Why should I keep my browser up-to-date? I have one employee whose fingerprint never works. Why? How should they clock in? How Do I Install TimeForge with Restaurant Manager Point of Sale? How Do I Use TimeForge with ASI Restaurant Manager? How Do I Configure TimeForge with Restaurant Manager Point of Sale? Manage Attendance is a new feature that allows you to handle all aspects of your employee’s attendance in one centralized location. 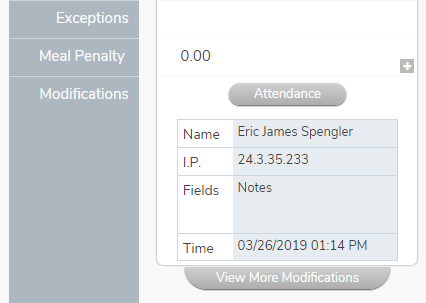 In Manage Attendance, you can easily view your employees’ attendance, compare attendance with scheduled shifts, quickly add or edit shifts, and more. 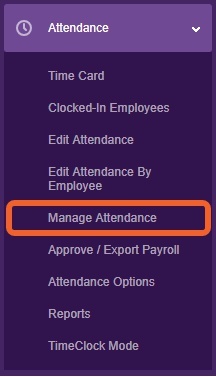 Open the Attendance tab and select Manage Attendance from the menu. Sorting and “Show Shift Times”: Sort the list of employees by department, position, exceptions, and more. 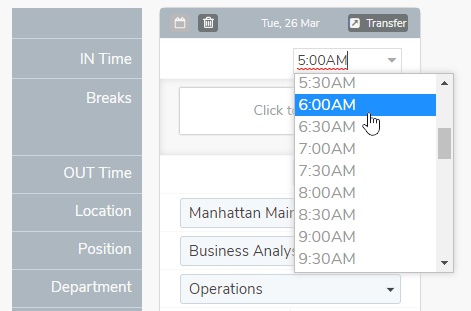 Click the button for “Show Shift Times” to add shift clock in and out times to the table. Week Date Bar: View attendance for a whole week. Change weeks by selecting the arrows, or go directly to a specific week by selecting the Calender icon. Clicking on a specific day will take you to the “Day View,” where you can see information focused to a single day. You can use the arrows on the top right and left of the chart to move to next or the previous week. Employee List: Employees are listed on the left side of the screen. Each row consists of that employee’s attendance information. Clicking on a specific employee will open up a more detailed view of their information. Attendance Table: Each cell shows scheduled hours and actual hours for each employee and day. The smaller number in size on the left is the employee scheduled hours, and the larger sized number on the right is their attendance hours. Clicking on a specific cell opens a pop-up that allows you to edit and add attendance for that day for that employee. Totals: On the right side of the table, the attendance entries for each employee is summarized. The number on the left is the total scheduled hours for the week and the number in the box represents the total attendance hours. When attendance hours are greater than scheduled hours, the box becomes red to highlight the fact. Date Range: When set to “Enter your own Dates,” then you can enter a custom date range by changing the dates for “From” and “To.” If set to “Use Predefined Dates,” then dates are preset by pay period. Row Titles: The left column shows the titles of each row. Shift Information: Each card of information includes clock in/out times, position, pay rules, modifications, and more. 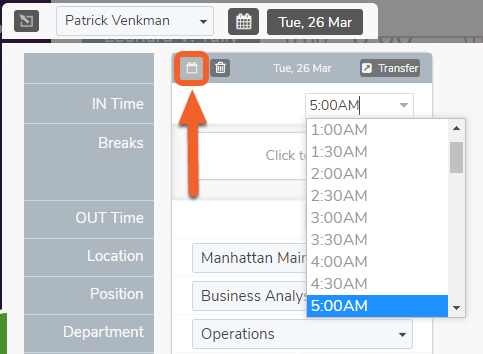 Clicking on a shift will allow you to edit the attendance information. When viewing a particular employee in Manage Attendance, to delete a shift, simply click on the Delete button which can be found to the left of the date stamp. Note that you can only delete shifts worked. To remove a scheduled shift, you must edit their actual schedule. a summary of the department’s hours, accruals, and any rules you may have set up for your employees. First select the day you’d like to transfer from the Manage Attendance screen to bring up the display. To move an employee’s punch to another day, click on the small calendar icon on the upper left of a shift that they worked. Next, a calendar will appear to allow you to select the date you’d like to transfer to. Once you confirm the move, the employee’s punch will be moved to the selected date. Please note that this will not move an employee’s schedule, only their punches. Editing an employee’s time is easy! All you need to do is click on a day that you would like to edit the time for, then select the time field you want to edit. Don’t forget to click the Save button in the upper right to save your changes! A message should appear at the top of your screen that says “Break Information was saved successfully.” It may also say “Attendance Information was saved successfully.” Once you’ve received confirmation, click Close. 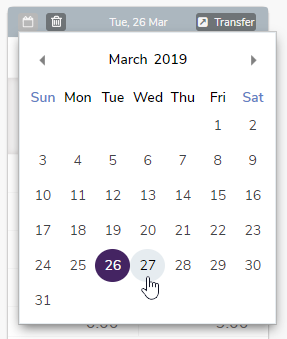 When you want to view only a single day in Manage Attendance, select a day you’d like to view by clicking on it in the date row at the top. This will show you all the shifts scheduled for the day you selected. To switch back, press the Close Day View button. To hide or show the shift times an employee was scheduled to work and actually worked, there is a button that appears on top of the chart in the center. Hide Scheduled hours: This will hide the amount of hours they were scheduled for and only show the hours the employee worked. Show scheduled hours: This will show both the hours the employee was scheduled for as well as the hours they worked. As always, if you need help or have any questions, please contact TimeForge Support. Our awesome support staff will be glad to answer any questions or help in anyway they can. Reach out to us by sending an email to support@timeforge.com, or call 866-684-7191. The best tools available for managing labor in the retail, restaurant, food-service, and hospitality industries. Includes applicant tracking, time management, employee scheduling, payroll, and other labor management tools.